Luxury holidays and short breaks on the Ring of Kerry. 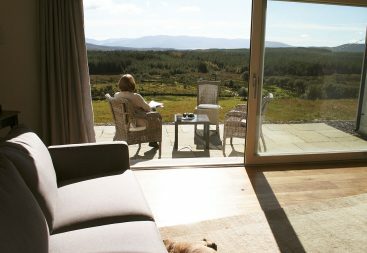 Our recently renovated Irish farmhouse exudes a feeling of space and easy living. Thoughtful touches and soft muted tones mixed with the natural elements of wood, slate and stone and contemporary touches of glass and chrome combine with modern conveniences to create a relaxing and comfortable home-from-home. 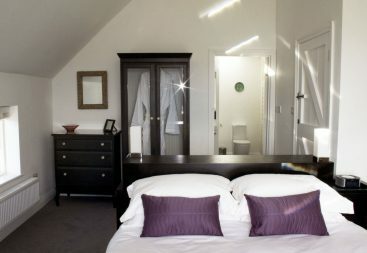 There are three beautiful en-suite bedrooms that will accommodate 6 people in luxury. We can also sleep two additional guests on comfortable fold away z-beds as well as provide a cot for any of our littler guests. The two ground floor bedrooms both have zip link beds that can turn from super-king size beds to twin beds. This flexibility means that whether you are a family or a group of friends the accommodation can be arranged to suit your needs. Please contact us to discuss your specific requirements. Outside of July and August either one or two of the bedroom suites can be closed off to provide the perfect sized accommodation for 2 or 4 people. Again please contact us to discuss your specific requirements. 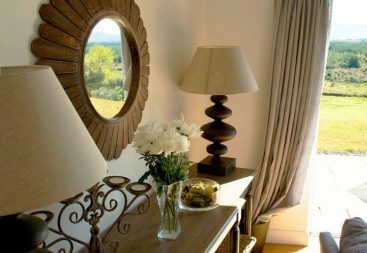 The bedrooms all have fantastic views and are beautifully appointed with comfy beds and soft cotton bedding. 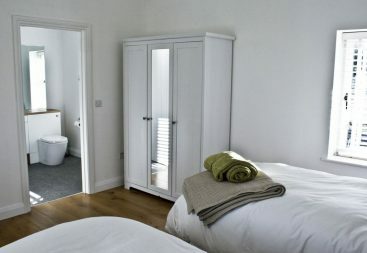 The en-suites all have baths and powerful showers, fluffy bathrobes and are stocked with luxury toiletries. The entire ground floor of the house is gently warmed by underfloor heating. The open plan contemporary living spaces provide a feeling of space. 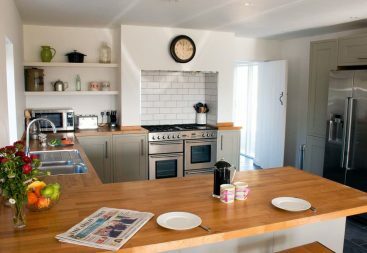 The large kitchen/dining room is very well equipped with a range cooker with double oven, grill and wok burner, a microwave, large toaster and an American fridge/freezer with an iced water dispenser. The utility room has a washing machine, separate tumble dryer and drying facilities. 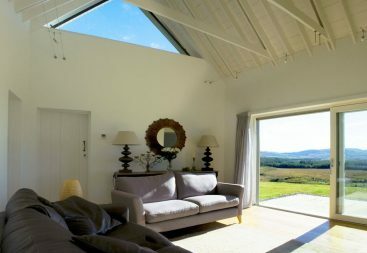 The living room is spacious and light with high vaulted ceilings, wood burning stove and large sliding doors that look out across the valley below. For your entertainment we provide Sky TV, a DVD player, a radio with iPod dock and unlimited wifi. There is also a separate study. Outside, there is also a large barn perfect for washing, drying and storing your bikes, kayaks and surf boards. 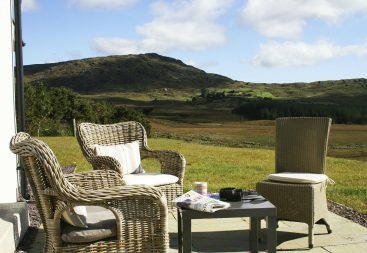 The cottage is extremely peaceful and designed for easy living so whether you decide to stay nearby or head out and explore all that the Ring of Kerry has to offer… you will have a comfortable home from home to return to. Smaller Group size: 2 guests in one bedroom, 4 guests in two bedrooms. 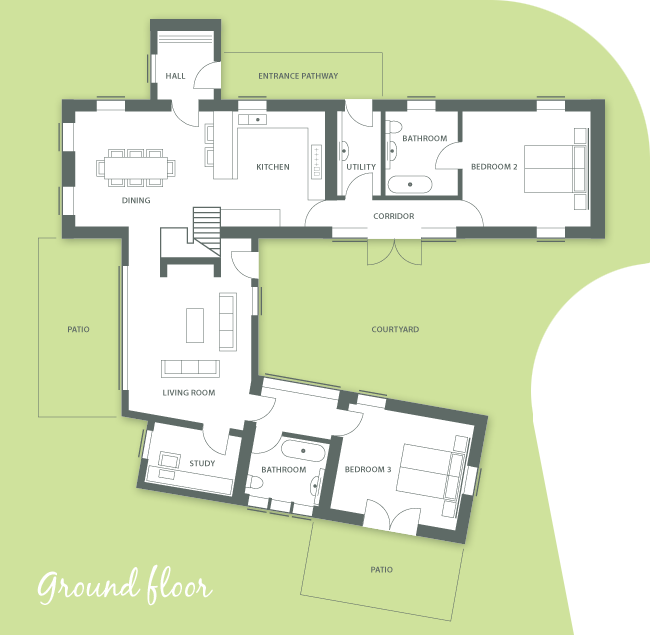 Bedrooms: 3 beautifully appointed bedrooms: two super-king/twin bedrooms on ground floor and one king size bedroom on first floor. All with en-suite. 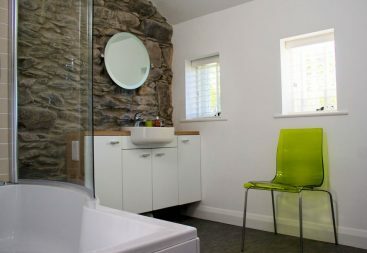 Bathrooms: Both ground floor bathrooms have baths with overhead showers. The first floor bathroom has a deep luxury bath with separate walk in shower. All bathrooms have heated towel rails. BBQ: Yes, a BBQ is provided for our guests. Pets: As dog owners ourselves we are happy to welcome responsible dog owners and well behaved dogs by prior arrangement only. Please note that we are surrounded by farmland with sheep and cows and so your dogs must be kept under control at all times. We charge €20 per pet to cover the additional cleaning. Please contact us to discuss your pet requirements further. 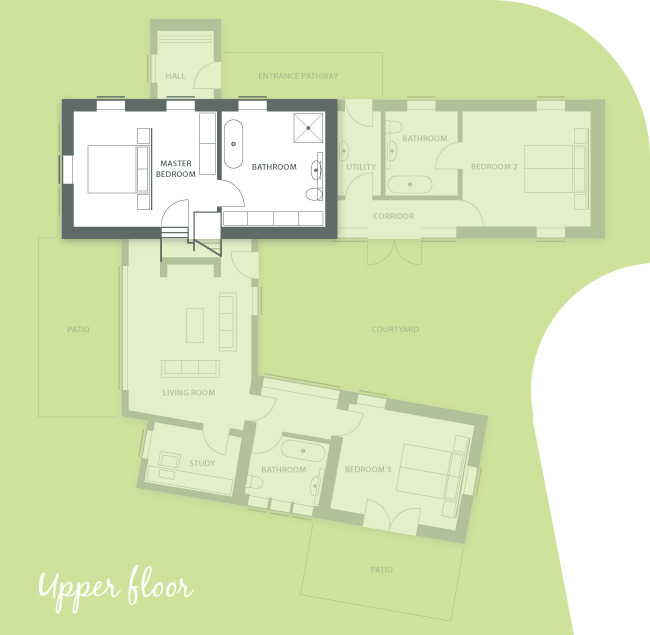 Disabled Access: Level access throughout ground floor but with one step on entrance to the property. We welcome enquiries from those that are mobility, hearing or visually impaired. Heating: Underfloor heating and Woodburning stove. Mod Cons: Sky TV, DVD player, Radio with iPod dock and speakers. Each bedroom has a clock radio with iPod dock. 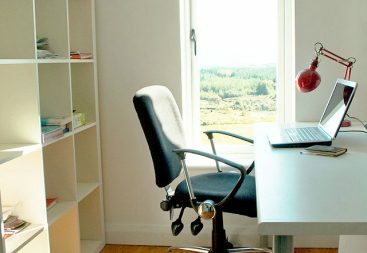 Internet & Communications: Unlimited Wi-Fi internet access throughout. Mobile Reception: Check Mobile Reception. Arrival Time: Arrival is between 4 and 6pm. Departure Time: Departure by 10am latest. Cautionary Deposit: A deposit of €200 will be charged. This will be returned to you within 14 days if no breakages or damage is incurred. No Smoking: We operate a no smoking policy in the farmhouse. Failure to comply with this policy will result in a €100 bill for cleaning carpets, curtains and upholstery. Your stay: We operate a minimum one week (Sat – Sat) during July and August and a minimum 3 night stay throughout the rest of the year. A fully renovated and spacious Irish farmhouse, characterised by soft muted tones mixed with natural wood, slate and stone. 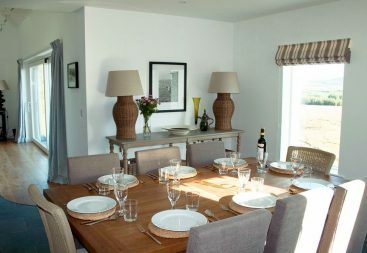 A relaxed, contemporary designed home-from-home in an idyllic setting. Relaxed, comfortable accommodation for 6-8 guests. Special prices for smaller groups.